Living a Fit and Full Life: A Wonderful Bible for Kids! NIrV Once Upon a Time Holy Bible by Zondervan! A Wonderful Bible for Kids! NIrV Once Upon a Time Holy Bible by Zondervan! The NIrV Once Upon a Time Holy Bible is an amazing Bible for kids! I love that the NIrV Once Upon a Time Holy Bible contains 24 full-color inserts because my kids love to see pictures in the Bible and I often find my younger kids that don't read yet thumbing through this Bible simply to look at the images. 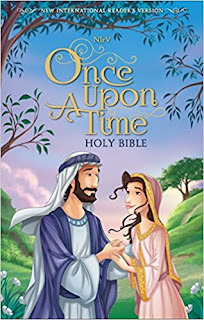 The NIrV Once Upon a Time Holy Bible also contains a presentation page which is perfect since this Bible would make an excellent gift for kids! You can find NIrV Once Upon a Time Holy Bible by Zondervan on Amazon, Barnes and Noble and other bookstores.